The world's third largest economy and a stable democracy, Japan remains a significant world power; but its economy has become stagnant, and its responses to the earthquake and tsunami of March 11, 2011 and the nuclear crisis that followed have raised international concerns. Despite being constitutionally modeled on Great Britain's "Westminster"-style parliamentary democracy, Japan has failed to fully institute a cabinet-style government, and its executive branch is not empowered to successfully respond to the myriad challenges confronted by an advanced postindustrial society. 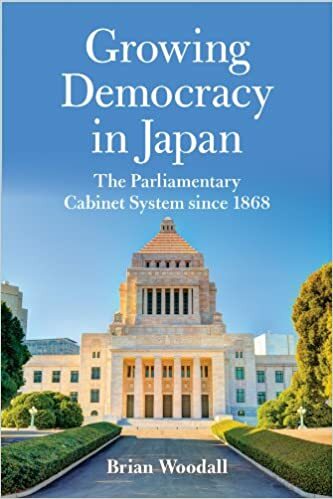 In Growing Democracy in Japan, Brian Woodall compares the Japanese cabinet system to its counterparts in other capitalist parliamentary democracies, particularly in Great Britain. Woodall demonstrates how the nation's long history of dominant bureaucracies has led to weakness at the top levels of government, while mid-level officials exercise much greater power than in the British system. The post--1947 cabinet system, begun under the Allied occupation, was fashioned from imposed and indigenous institutions which coexisted uneasily. Woodall explains how an activist economic bureaucracy, self-governing "policy tribes" (zoku) composed of members of parliament, and the uncertainties of coalition governments have prevented the cabinet from assuming its prescribed role as primary executive body. Woodall's meticulous examination of the Japanese case offers lessons for reformers as well as for those working to establish democratic institutions in places such as Iraq, Afghanistan, China, and the new regimes born during the Arab Spring. At the very least, he argues, Japan's struggles with this fundamental component of parliamentary governance should serve as a cautionary tale for those who believe that growing democracy is easy.